Slackers is hosting a Batman v. Superman art contest! Create your best Batman or Superman art and submit it by March 15th to enter the contest. Prize packages will be awarded for age brackets 12 & under, 13-18, and 18+. The prize packages will include tote bags, sweatbands, t-shirts, passes to a Special Sneak Preview of "Batman v Superman Dawn of Justice", and more! 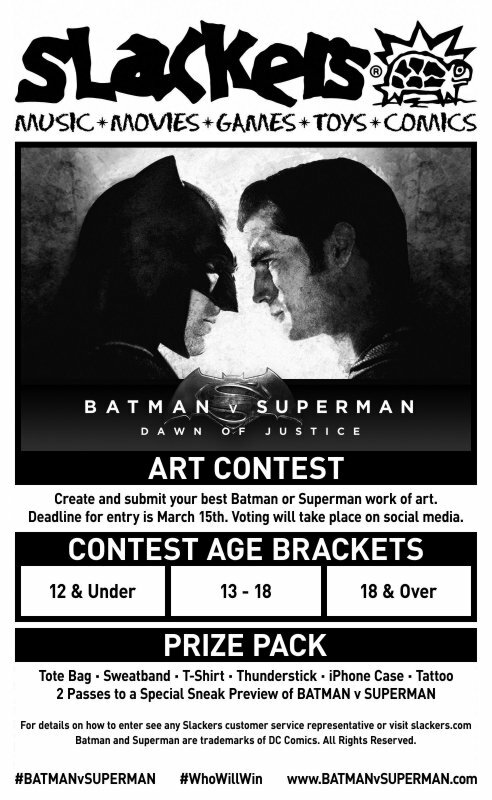 To enter, first create your Batman or Superman (or BOTH) art. It can be a drawing, painting, sculpture, song, costume, or whatever you can make. Be creative! Then email your submission to BATMANvSUPERMAN@slackers.com by March 15th. Be sure to include your name and age, as well as a phone number where we can reach you. Submissions can be sent as an email attachment or as a link. If you make a sculpture or other physical media, feel free to include pictures from a few different angles. Voting will take place on Slackers social media. You can view the winning entries on our Facebook page!